The great plant guru, collector and nurseryman, Harlan Hamernik, from Clarkson, Nebraska introduced many new plants to the gardeners across the U.S. over his lifetime. In his later years, he focused on neutraceuticals, or, healthy edibles and medicinals, some of which were used by Native Plains Indians. Especially, this interest was from those sources which were in the form of perennials, shrubs, and trees – something the Midwest is not known for in our current day and age, but were key to the health of the nomadic tribes which preceded us. My impression of Harlan from personal experience, was that he was an incredibly intuitive plantsman. After he passed away in 2012, a small 3-person crew and nursery carried on his work, and I visited them to learn more about his final plant interests. This location was near the farm where I grew up. Next, find the list of plants and trees he would have recommended to farmers or landowners who would like to incorporate edible or medicinal perennials into their farm, either as a hobby, or as a value-added crop or food product. Note that this list works in Nebraska, but most of these plants are extremely hardy and would grow well in much of the U.S., especially the Midwest and Upper Midwest. The Aronia plant which produces the common named “chokeberry” would have been a number one suggestion. Although the awareness of this plant is catching on, a large percent of the public doesn’t know about it yet. In general, the dark blue, purple and black berries contain high levels of antioxidants, making them superberries, or superfoods. We all know that blueberries are a superfood, but, the Aronia berry contains three times the amount of antioxidants that blueberries do. (Note there is a current question about the benefits of antioxidants in this past year’s news and studies.) Indians used these berries as an ingredient in Pemmican. High tannin levels make these berries tart, thus the name “chokeberry”. The bright side of this is that birds tend to leave them alone, as opposed to other berries which you need to cover with netting, or pick before the birds do. Three varieties of Aronia Hamernik's nursery recommended were Black Aronias: Aronia melanocarpa ‘Galicjanka’; Aronia melanocarpa ‘Viking’; and, Aronia melanocarpa ‘McKenzie’. ‘Galicjanka’ is a cultivar from Poland which tolerates drier soil conditions; ‘Viking’ is from Scandinavia and produces very large fruits; and, ‘McKenzie’ was produced at North Dakota State which has extra-large berries, and is drought and cold tolerant. These shrubs need chill hours so don’t grow in the South. They are drought tolerant once established, and they produce beautiful fall color. 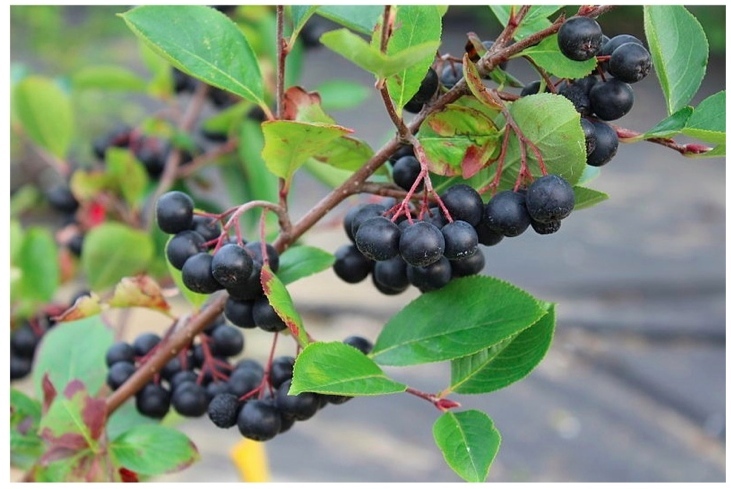 Aronia berries are used in smoothies, salsas, jellies, breads and muffins, and for wine. A supplement form is available which uses a powder to create an extract. A company in Omaha, named “Superberries” owned by Kenny Sailors, uses Aronia berries to make products such as gummy chews, frozen berries, and concentrate. Some make wine from Aronia berries, too. Another of Hamernik's recommended shrubs is Crandall’s Clove Currant, or Ribes odoratum ‘Crandall’. This shrub also produces a black medicinal berry which is high in antioxidants and polyphenols. This grows in rich well- drained clay soil to plant hardiness zone 4. The Redleaf rose is a beautiful hardy shrub rose producing a hip rich in Vitamin C. I have personally grown this in my yard and love the iridescent blue-green sheen to its leaves. If you grow it, as an added bonus you will occasionally have a volunteer pop up in your yard. Also, Rosa Pomifera, or the apple rose, is a good hardy choice which produces good fruit. One can make tea from the rose hips of either plant. Elderberries, or Sambucus species, are another hardy shrub which produces a black berry that is high in Vitamin C and antioxidants. These grew wild when I was a child and I used to help my grandmother pick them to make jelly. I’ve personally picked them from road ditches to make a pretty darn good pie, if you don’t mind the seeds. Even better, you can make a combination berry pie such as elderberry-cherry. Elderberries grow across the U.S., but are less drought-tolerant. The Serviceberry, or Amelanchier canadensis, produces large black berries that are loved by both humans and birds. They make delicious jams and pies. A good variety is alnifolia ‘Parkhill’ which is a dwarf. The American Hazlenut is formally named Corylus Americana. It is a small tree which produces an edible nut. It likes afternoon shade and requires two trees for nut production. The Dwarf Chinkapin Oak is a great native shrub oak. By 3-4 years of age, it produces a nut which is valued by wildlife. These nut producers are about 15-18 feet tall, but can be trained shorter. Hamernik would collect this tree’s seeds from the wild. Photo credit: Purple Aronia berries, by Konjica.